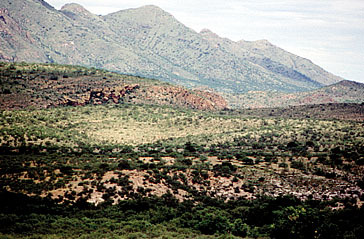 Sonoita Creek State Natural Area in 1993. In the early 1970’s, the State Parks Board accepted the Natural Areas Program as a responsibility of the agency. The Program was developed to recognize those individuals and entities managing sites in such a manner as to protect their integrity and environmental qualities. The Heritage Fund, approved by the voters in the fall of 1990, changed the program from one of recognition to a program of acquisition and management of identified natural area sites as funding was provided for both of those purposes. Areas along Sonoita Creek, in southern Arizona, had long been identified as desirable for potential park sites and the Board had acquired Patagonia Lake in 1975. The Natural Areas Advisory Committee also identified Sonoita Creek as a high priority area for potential acquisition for the Natural Areas program. The State Parks Board toured sites along the Santa Cruz River and lower Sonoita Creek as a part of its Board meeting held at Rio Rico Resort on September 18, 1992. The Board requested that Parks staff do further study and identify owners of the properties for consideration of potential acquisition. One of the largest private parcels closest to Patagonia Lake State Park was owned by a partnership with John Ratliff as a partner. This was the same John Ratliff that State Parks dealt with during the acquisition of Catalina State Park. Director Travous met with Mr. Ratliff in December 1992 to discuss the potential of acquiring the acreage owned by Rio Rico Investment Limited Partnership. Over the next few months, the staff and Assistant Attorney General Phyllis Hughes negotiated with Mr. Ratliff and his partner, Lloyd Levinsky. At the June 2, 1993, meeting, the Parks Board approved the acquisition of the 5,001 acres and authorized the Director to sign the Option Agreement. All the required work was completed; the check for the $2.8 million was deposited in escrow and John Ratliff, General Partner, signed a Special Warranty Deed on December 20, 1993. A legal survey of the property showed that the actual acreage acquired was 4,914. Coal Mine Spring area in 2004. Sonoita Creek State Natural Area (SCSNA) is located in Santa Cruz County downstream from Patagonia Lake State Park along lower Sonoita Creek, a perennial tributary of the Santa Cruz River. The area is about 50 miles south of Tucson, just northwest of State Highway 82 and 10 miles north of Nogales. The acquisition of the original 4,914 acres of the SCSNA was finalized on December 20, 1993. In 1995, the State Parks Board applied to purchase approximately 3,033 acres of State Trust Land owned by the State Land Department. The State Trust land extends from the eastern boundary of the SCSNA and surrounds Patagonia Lake State Park. This would be the exchange land discussed in the Patagonia Lake State Park Section. The State Trust land is included in this section because it is the intent of the Parks Board to acquire all or part of this land for the SCSNA. SCSNA is bordered on the south by 2.8 miles of Sonoita Creek, a perennial stream that has a well-developed mixed deciduous broadleaf riparian forest with an adjacent upland watershed. 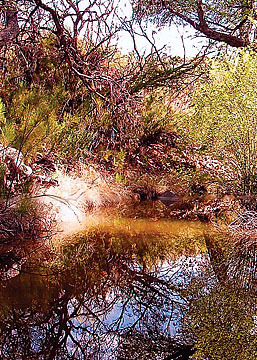 The proposed purchase of Parcel 2 will add another 1.5 miles of stream and riparian corridor. The area supports uncommon plant species and a high diversity of birds and other wildlife. The federally endangered Gila topminnow, a rare native fish, thrives in Sonoita Creek and its tributaries, Fresno Canyon and Coal Mine Canyon. To provide security and educational tours of the SCSNA, Rick Gagnon was hired as the first Manager in 1995. Following improved access to SCSNA and development of a visitor center for the Natural Area located within Patagonia Lake State Park, the SCSNA was officially opened. 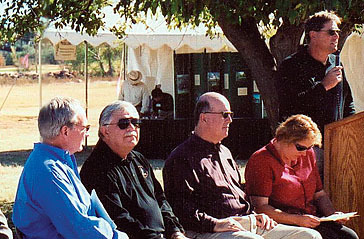 The Grand Opening was held on February 19, 2000, with Ken Travous, State Parks Director, welcoming over 200 visitors to the event. He told the group that volunteers are “our first line” in serving the public. Ken praised the park volunteers and invited them to participate in the ribbon cutting ceremony. Jay Ream, Assistant Director, also spoke and recognized the important role the Heritage Fund had in providing the money to acquire this land. Various presentations related to the SCSNA were held throughout the afternoon along with pontoon birding trips on Lake Patagonia. Since the original acquisition did not completely include both sides of the creek, State Parks has acquired three lots for a total of 111.4 acres that border and include portions of Sonoita Creek. Another major acquisition was completed on June 11, 2003, that added 259+ acres that includes property along a four-mile stretch of Sonoita Creek from the former western boundary of SCSNA to the confluence with the Santa Cruz River in Rio Rico. This land was purchased from Rio Rico Properties. This acquisition included a 10-year cooperation agreement that involves the donation of 2 additional smaller parcels for construction of a visitor center on one and a residence area/trailhead on the other, design and planning services, and an annual contribution to the SCSNA for four years. Rio Rico Grand Opening in 2003. The State Parks Board and Rio Rico Properties, Inc. hosted a special unveiling in celebration of this acquisition on November 20, 2003. Suzanne Pfister, Chairperson of the State Parks Board, Ken Travous, State Parks Director, State Representative Jennifer Burns, County Supervisor John Maynard and Guy Tobin and Dennis Getman from Rio Rico Properties all shared in the Welcome and Opening Remarks. On June 7, 2004, the State Parks Board finalized an Intergovernmental Agreement with the Game and Fish Commission that provided for management of the Coal Mine Springs (2600 acres) owned by the Commission. The Commission purchased Coal Mine Canyon for $2.25 million for the protection and conservation of the tiny Gila topminnow, one of the first species listed by the federal government as endangered. This property adjoins the SCSNA on the northeast corner. A trail easement (1.62 acres) was acquired from the State Land Department (#16-105749) on September 13, 2004, that connects SCSNA to Patagonia Lake State Park. The total acreage managed within the SCSNA stands at 7,886.5 acres. Footnote: Partnerships with the Arizona Game & Fish Dept., U.S. Fish and Wildlife Service, and Trust for Public Land have allowed acreage to be added in the Coal Mine Spring and George Wise Spring areas. The total acreage under management of Sonoita Creek State Natural Area is 9,584 as of 2008.